~Mrs. 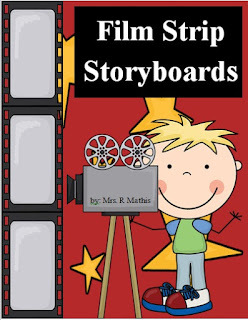 Mathis' Homeroom~: Filmstrip Storyboard FREEBIE! I am a member of the Ontario Core French Teachers group on Facebook and recently, someone posted that they were looking for a filmstrip storyboard for her fourth graders. The plan was for students to do a story retell of a play by drawing pictures in the box, and writing one or two simple sentences underneath. Unfortunately, she couldn’t find what she was looking for anywhere on the web. How frustrating! I knew I had purchased clipart from Scrappin' Doodles that I could use to easily create this worksheet for her, so I offered to help. Here’s the result and I’m offering it as a FREEBIE to you as well! I made two different sizes for the worksheet, one 8x11 with 3 boxes, and one 8x14 with 4 boxes. What kind of project could you do with a Filmstrip Storyboard? How cute and clever! I can use this with my sixers for sure! Thanks for sharing! These are super cute! My kiddos will love them. Thanks for sharing.